When I first moved to Seattle I thought I would love the rain. I want to return to the Easter Weekends of my youth. So, I found some photo's of those sun shiny days and they cheered me up a bit. This is my Mommy and me. 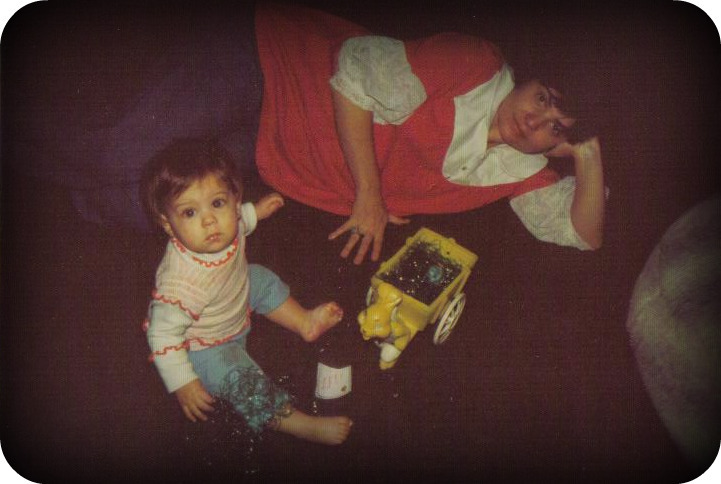 She recently gave me that maternity top (which my Grandmother made) and I hope to wear it someday. I love looking at this photo. I found it the last time I went home. I had never seen it before and now it means so very much to me. I love how I am cuddled up with my Daddy. I have my Daddy's nose so he liked to take profile photo's of me. 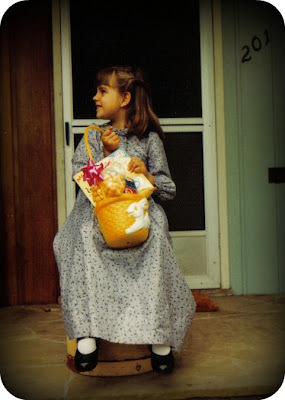 I love that I still have that very same Easter basket to help me out on my egg hunt. Thank you for going down memory lane with me. 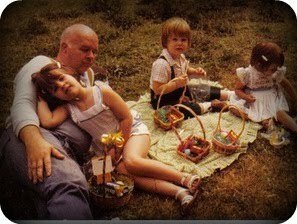 I hope your Easter weekend is full of sunshine and chocolate bunnies. Those photos are so very very sweet. I especially love that your daddy took profile pictures of you. Happy Easter friend...I miss sunny ones also. Snow and rain here - indoor hunt to be had. Boo. I love those pictures, Kat! Those are such nice photographs to have. 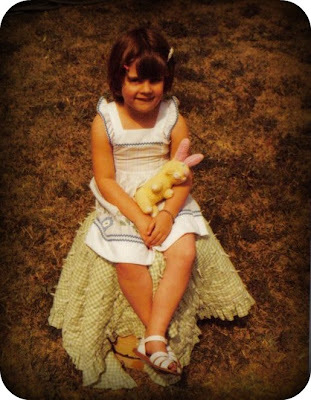 :) I'm glad you still have the same easter basket. we got a different easter basket every year, but my mom now says she wishes she had gotten us one really special one that we used every year. I think that's a neat idea. I want to paint easter baskets for my kids someday. I hope you have a wonderful easter!!!!! thanks for sharing these retro pics. your family is beautiful. I loved this post. I really enjoy seeing your old pictures. I also like to hear about the things that you used to do with your family. I love good memories.